Synopsis: Poets Samuel Taylor Coleridge (Linus Roache) and William Wordsworth (John Hannah) form a friendship and creative partnership after becoming involved in revolutionary activities inspired by events in France at the end of the 18th century. Encouraged by Wordsworth’s sister Dorothy (Emily Woof), they seek inspiration from nature, and each other, for a new kind of poetry. Their fruitful relationship quickly turns sour, as Sam gets closer to Dorothy, to the dismay of his wife Sara (Samantha Morton), becomes addicted to laudanum, and becomes the subject of William’s destructive envy. Pandaemonium has been produced for the BBC with a generous subvention from the Lottery fund. Poetic licence I’ve heard of. This is TV licence run mad. My work has focused for a long time on public service broadcasters (and their interventions in British film), and Sutherland’s phrase has always stuck with me as it summarises so neatly the extra expectations that certain kinds of institutional support can bring to bear on a film – in this case that the material should have a degree of accuracy to the ‘real’ story. But this is a discussion for another time. The film is clearly told from the drug-befuddled, paranoid point of view of poor, tormented Coleridge. It does not therefore offer itself as a reliable Ofsted report on the Lakes School. It is clear that this characterisation of Coleridge does, indeed, assist a reading of the film that avoids obsessive fact-checking, but it also plays into a tired trope that equates mental instability and genius, even if it is done here with some verve. 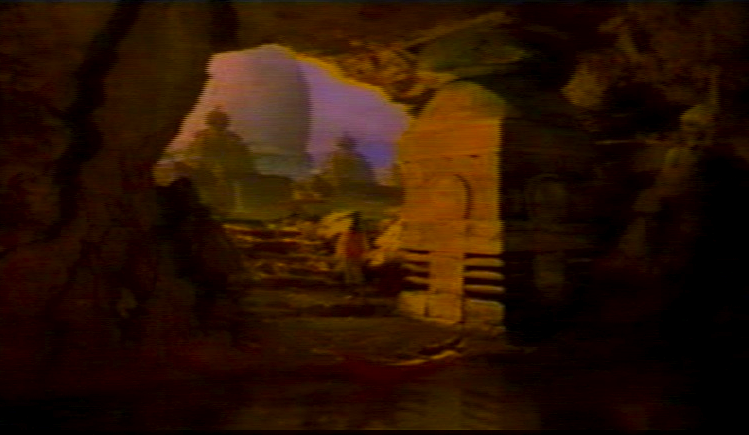 There is a particularly nice dream-sequence around the composition of Kubla Khan where Sam sails through the imaginary caves that would lead him to Xanadu, were it not for the interruption of the infamous ‘person from Porlock‘. Who else could this be but Wordsworth who, the film insinuates, deliberately sabotages the writing of the poem through jealousy and spite? One morn we stroll’d on our dry walk,/ Our quiet house all full in view,/ And held such intermitted talk/ As we are wont to do. Wordsworth is presented as Machiavellian jobsworth, a plodder who leeches off the superior talent and genius of his friend and sister. Wordsworth actually works at his poetry: we see him stomping through the countryside, his hulking steps matching the iambic pentameter of his verse, suggesting, I think, that he is quite literally a pedestrian writer. Though John Hannah plays him with some sympathy – a frustrated man who recognises his own shortcomings beside the talent of his friend – this Wordsworth is uneven, and his motivations often obscure. For me, the most interesting and frustrating character here is Dorothy Wordsworth. 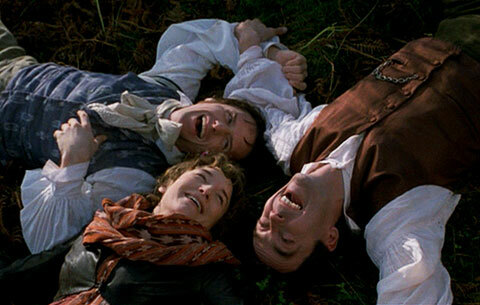 Dorothy becomes a central character in this version of the poets’ lives, and the film portrays her as an independent spirit, a challenging intellectual, a fierce and difficult woman. All that potential and energy, though, is put into lubricating the creative engines of the men in her life. She acts as a creative crutch to her brother, literally re-writing his poems for him line by line. This leads to the silliest joke in the film: William muses “I wandered lonely as a cow”, to which Dorothy gently suggests that ‘cloud’ would be better. 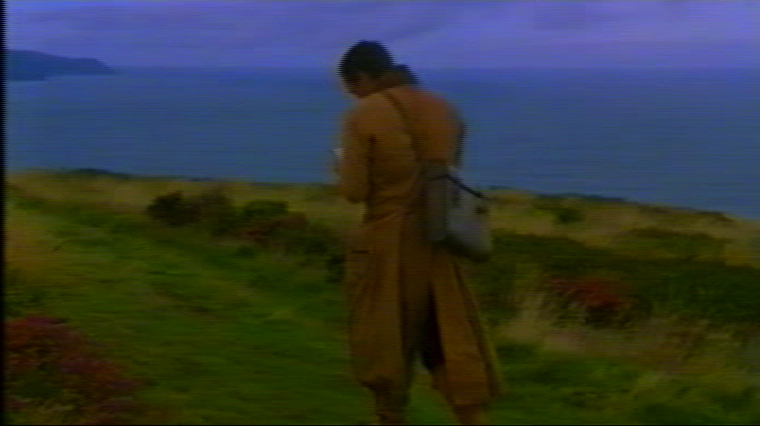 Dorothy is used here to serve the film’s characterisation of William Wordsworth as a creatively stifled non-genius. For both poets, she is the object of sexual fantasy, but mostly of creative inspiration, a muse. She is the original Manic Pixie Dream Girl: encouraging William and Sam out of stifled conformity to verse structure and proper subject matter, persuading them to convert sensual and natural experiences into poetic expression. The costuming of Woof for the role is revealing in this regard. She wears deep primary colours, brilliant blues and deep reds. In this image, the (anachronistic? I’m no expert) sequins on her bodice are visible, typical of her costuming, designed to showcase the personality flashing brightly against the natural, beautiful landscape. Her hair also really captures the film’s desire to have its period drama cake and eat its Millennial pop stylishness – long enough that it appears in keeping with the historical time the film is set in, but styled in such a fashion as to give Woof a distinctly early-00s choppy pixie cut. Contrast this to poor Sara Coleridge. (Apologies for the terrible quality of the photos. I had to screen grab from a VHS- DVD conversion.). For the larger part of the film, Sara is de-glamourized, clothed in natural colours, head covered, children her only accessory. 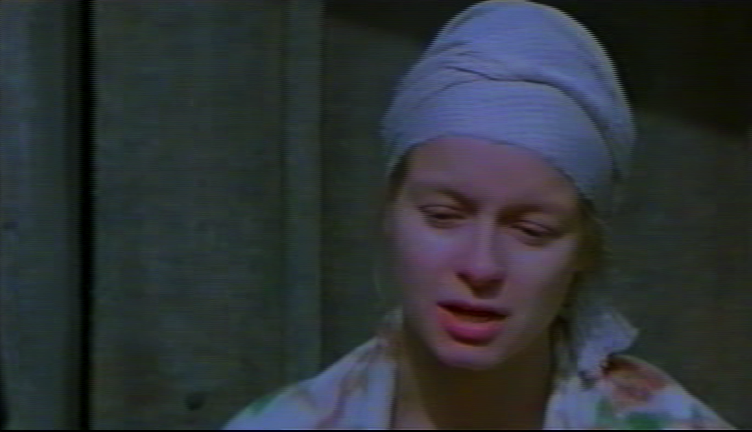 Dorothy’s spinsterhood offers her the freedom to live a life of the mind, Sara’s duties as wife and mother tie her to a life of earthy drudgery in a manner that is not, for me, sufficiently critiqued by the film. It’s particularly disappointing given how the character is presented early in the film: she’s a firebrand, enthusiastically engaged in revolutionary activities, able to stand up to those around her, a proto-feminist who creates neologisms in political protest at her lack of formal education. Her choice to join Sam and Robert Southey (Samuel West) in their attempt to construct a ‘Pantisocratic’ society (in which intellectuals commune with nature and live off the land in a 19th Century version of The Good Life) is her downfall, as Sam’s irresponsibility consigns her to a life of care. Not enough is done with this story, nor any of the micro-narratives in the piece: none of them quite land with the punch that they ought to. That, indeed, is Pandaemonium’s problem, not its lack of respect for historical accuracy or pantheon poets. It wants to speak of one fin-de-siecle from the perspective of another. It wants to apply late 20th century postmodern irreverence to a story taking place after the groundswell of revolution at the end of the 18th century. It wants to make Coleridge and Wordsworth into atavisms for Lennon and McCartney. But none of this quite comes off.